The most striking thing about this image in the Universal Waite deck is the heavy burden that the central figure is struggling to carry, it seems almost too heavy to bear. In the background we see a village, symbolizing the community that he is serving, and the ploughed fields that testify to the progress of his labours. The historical figure that came to mind when we started discussing this card at first seems like a very unlikely match to the card, but the more we discussed this the more it seemed to fit her so well. Today we will focus on the story of Mother Theresa. Mother Theresa chose to serve the poor people in India. A country where Catholicism didn’t have a large following, compared to the two major religions there of Islam and Hinduism. She must have often felt completely over burdened by the difficult task ahead of caring for the poor in a country where so many people are poor. She was already at a disadvantage, being Catholic, not to mention the realities of every day life under the caste system. The injustices and inequalities that she witnessed on a daily basis must have often caused her to feel as if she was fighting a loosing battle. As if her task wasn’t overwhelming enough, she admitted towards the end of her life during an interview with TIME magazine that she had sought in vain for the presence of God, she looked for any evidence of God in the desperation that she encountered every day in India. She continued this search for the last 40 years of her life, in vain. For 4 decades she had secretly lost her faith in the God she served, yet she persisted to do what she believed to be God’s work. She worked tirelessly amongst the poor to care for them and to give them a sense of belonging, something that many of them had not had before. She uplifted the poor in her continued compassion for them, and by giving them an identity. Finally they too ‘belonged.’ Bearing in mind the inequality of the caste system, she empowered the poor by giving them a sense of self-worth in the knowledge that they mattered very much to her. Even though they were impoverished for life, many of them were deeply and personally touched by her compassion for them and became spiritually wealthy as a result. Through her hard work, despite often being overburdened and possibly overwhelmed, Mother Theresa uplifted her community through service and unconditional love. Recognition came in the form of a Nobel Peace prize, but perhaps more importantly, her name has become synonymous with compassion. 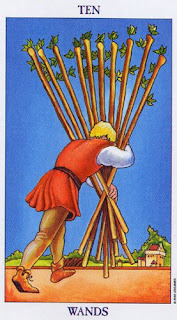 Re-examining the Ten of Wands card one can only hope that this figure too reaps some reward for his tireless efforts as he too serves his community in what appears to be an overwhelming task. If you can't feed a hundred people, then feed just one, for love begins at home, and it is not how much we do... but how much love we put in that action. Wow! What an awesome and moving post - oh and I wonder if Mother Teresa herself was the Evidence of the God she served. Sometimes we look without when all is within. 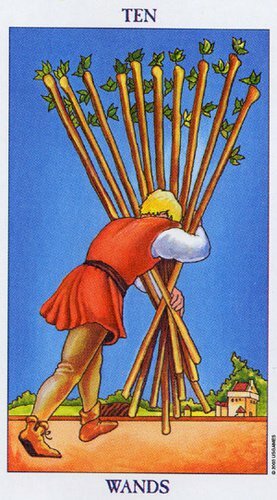 A great blog post on the ten of wands. I find it means struggle in a lot of my personal readings. You have shed more light on the inner meaning of the card. I like a psychic reading where tarot are used along side intuition. Saw your link on Aeclectic Tarot! Wanted to share enthusiasm for Tarot blogging :) Of course mine is http://gnostictarotcards.blogspot.com Glad to see more Tarot Blogs on the net. Good Job! I'd love to know what you think of the deck I just launched on Kickstarter, called "The Tarot of Creativity." It is a heady mix of numerology, Tarot keywords, and upside-down thinking. It is a tarot about the creative process.